Muzzleloaders are limited in velocity by the physics of the gun and the limitations of the components. The only place left to increase performance is through bullet design... Introducing the Dead Center Bullet. Dead Centers are designed with extremely high ballistic coefficients (BC) which result in higher downrange velocities and therefore higher downrange energy on impact. In addition, the Dead Center is designed for shoot-thru performance. 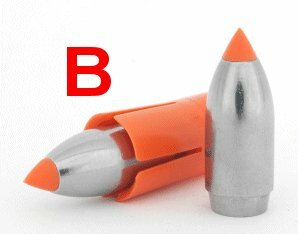 The polymer tip and the cavity behind the polymer tip are constructed to dissipate most of the bullet’s energy while still gaining complete penetration. Velocities over 1800 fps with 100 gr. 777 - Use a 150-200 yard zero for dead aim. *Flat Rate Bullets Only Shipping Terms: A USPS promotional FLAT CHARGE of $10 per shipment for bullets only orders. Maximum 15 lbs mix and match per shipment. Out-of-stock and partially out-of-stock orders will be back-ordered, held, and shipped all together in one shipment as soon as we are re-stocked. (Split Ship of partial back orders is available at $10/shipment). Bullets Only - No loaded ammo or other items - More Info at our Flat Rate Bullets Page. Choose "$10 Bullets Only Shipping" at Checkout. Worked up a load using Blackhorn 209 powder. Shooting 1950fps with a .45 group @ 100yds. Very impressed so far, now all I need is a 300 yd shot on a deer instead of steel.